You are currently browsing the tag archive for the ‘Order’ tag. “Coders are now habitat providers for the rest of the world.” ~ Vitorino Ramos, via Twitter, July, 17, 2012 (link). Video lecture – Casey Reas (reas.com) at Eyeo2012 (uploaded 2 days ago on Vimeo): From a visual and conceptual point of view, the tension between order and chaos is a fertile space to explore. For over one hundred years, visual artists have focused on both in isolation and in tandem. As artists started to use software in the 1960s, the nature of this exploration expanded. 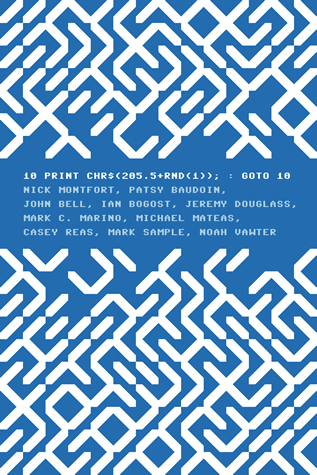 This presentation features a series of revealing examples, historical research into the topic as developed for Reas‘ upcoming co-authored book “10 PRINT CHR$(205.5+RND(1)); : GOTO 10″ (MIT Press, 2012, book link; cover above), and a selection of Casey‘s artwork that relies on the relationship between chance operations and strict rules.